The way that my makeup is stored means that the makeup that I'm not regularly using is kind of out of the way, like the way you might store out of season clothing. So, like out of season clothing, every 6 months or so I need to go through & do the Spring/Summer to Autumn/Winter swap. 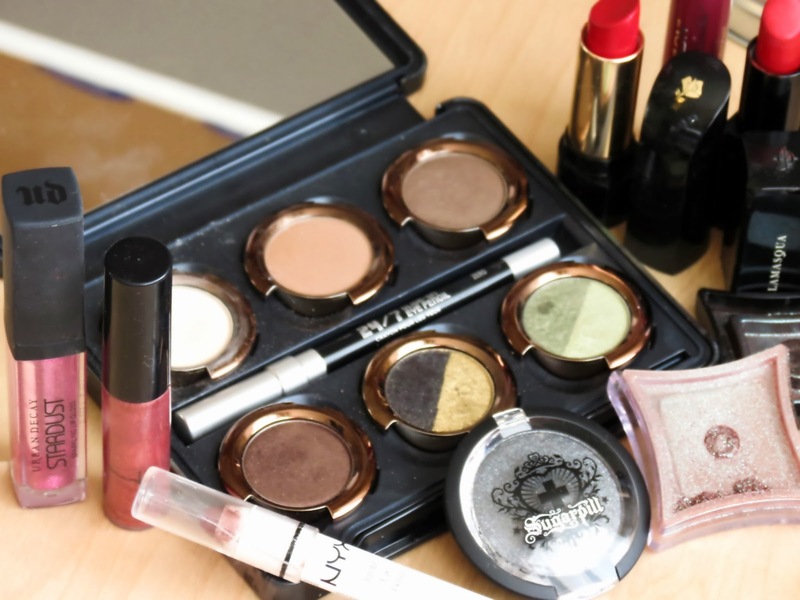 Anyway, these are the makeup items I finally pulled out of my collection that I only wear in winter. The first is the Theodora Palette from Urban Decay. I was so excited when I first got this, it was connected to an awesome film & it was hard to get hold of plus the packaging etc. Then the hype wore off & it got put away with all the other palettes I love but I don't have space for right in front of me. Well I pulled it back out & it's lovely. I feel so stupid for not using it more regularly! The colours are particularly great for autumn/winter, the browns are quite dark & warm & the gold is a lovely Christmas tone. NYX Jumbo Eye Pencil in Rust. This is such a lovely colour & I actually prefer the texture to the texture of Milk but most of the year it is too strong & my eye-lids are too oily. In winter, however, both of those problems are partially alleviated. Illamasqua Pure Pigment in Fervent. I am almost certain I got this as a free gift at some point. It's definitely not something I would buy for myself. It is, however, totally stunning & a great winter colour. I shall be challenging myself to use this a lot as we go into 2014. Sugarpill Eyeshadow in Soots & Stars: I know this was an accidental purchase. It was at IMATs (see my blog post here). The poor people at the Love Makeup stall were so busy they didn't notice when they accidentally gave me this instead of the matte black from sugarpill. Anyway, I hadn't used it since because I'm not exactly a black eyeshadow kind of girl but I am challenging myself to use it & so far it is going great, the quality & pigmentation are amazing! I don't have anything for base & cheeks cause I never use bronzer, I only have 5 blushers & I use whatever foundation I like all year round w/e. So I guess lips is next. Mostly I don't have seasonal lip colours, if I want to wear a colour, I wear it. But I have too many red lipstick so I put some of them away for most of the year & there are a couple of other bits that I don't really need most of the year. Mac Lipglass in Restless. Another limited edition product. The autumn/winter lipglosses I love usually are I'm afraid. This is such a lovely auburn red shade I would happily wear it all year round. But the tiny bottle means that I only get it out in the winter & use it as infrequently as possible. Revlon Just Bitten Kissable Balm Stain in Crush. I've been thinking about this product since the middle of September & I never got round to getting it out. It's one of those totally wearable dark lip colours that every woman should own. Heck everyman should own one too, why should they miss out on the fun? Illamasqua Lipstick in Sangers. This is actually one of my favourite reds & I honestly can't remember why I put this one away...I guess it was because the packaging, it is kind of chunky..
Lancôme Le Rouge Absolue in 132. A few years ago there was this stunning Christmas advert for Lancôme of Scarlett Johansson wearing the most stunning red lipstick & so I went to a Lancôme counter & this is what they gave me. I think it is actually the only moisturising red lipstick I own & it is quite bright compared with the reds I usually wear. It is, however, perfect for the centre of your lips when you are doing a dimensional red lipstick look with 2 or 3 different shades (which is something I do a lot in the winter).